-> Join the Google+ Page! 8/2013 Exciting! 365 Vegan Smoothies has 5 star ratings (highest possible!) on both Amazon and B&N! 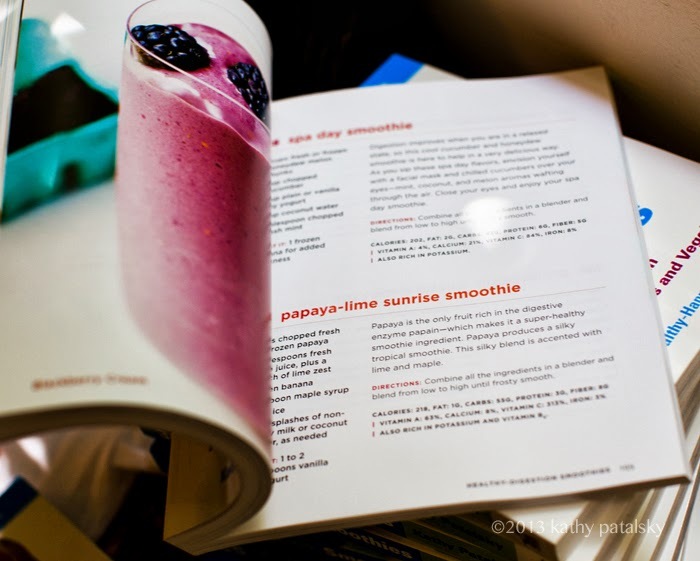 6/2013 Get Sneak Peeks of the inside of 365 Vegan Smoothies - this blogpost! 5/2013 New on-sale date is July 2nd, 2013. Details here. 2/2013 Some fun facts about my book: Each recipe in my book includes nutrition info including calories, protein, fat, fiber and more! There are over 40 full-page color photos throughout the book. And lastly, in addition to 365 recipes, you get my smoothie guidance: FAQs, Myths/Facts, wellness and smoothie tips, ingredient guide and more! 1/2013 365 Vegan Smoothies page on Facebook. Hope you will 'like' it! Updates will be posted via this fan page! 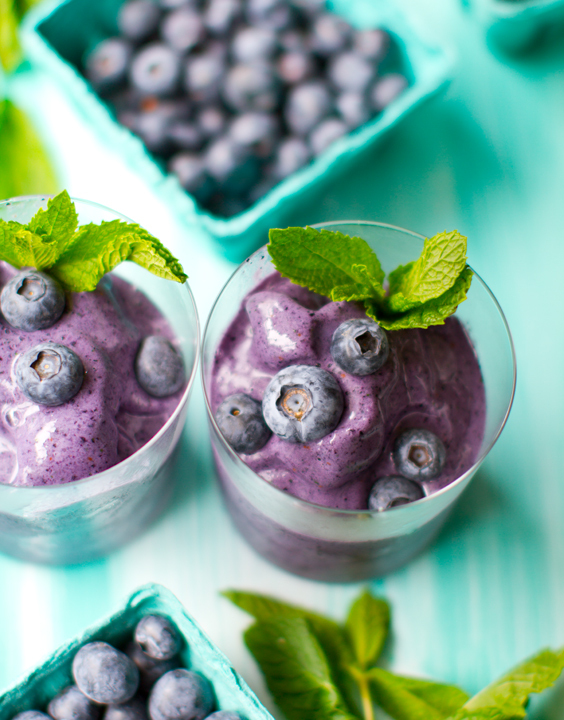 Book Description: "From one of America’s most vocal health-food advocates: a bounty of delicious, healthy vegan smoothies that deliver fun, flavorful wellness every day of the year. With 100,000 Twitter followers and a blog that receives half a million unique visitors a month, food writer Kathy Patalsky loves sharing her passion for healthy, vegan cuisine. With 365 Vegan Smoothies, she makes it possible for everyone to enjoy this daily diet enhancement that is free of animal products (even honey) and the saturated fats, chemicals, and hormones that often accompany them. From her frosty sweet “Peach Pick-Me-Up” to green smoothies such as her revitalizing “Green with Energy,” Patalsky’s innovative smoothie recipes are built around themes such as brain boosters, weight loss, healthy digestion, and detoxification. She also includes mood tamers, such as the “Cheerful Chocolate Chia,” with B-complex vitamins and omega fatty acids to boost serotonin levels. Featuring vibrant color photographs and simple steps to stock a healthier pantry, 365 Vegan Smoothies serves up the perfect blend for everyone." Foreword by Gena Hamshaw of Choosing Raw! *note: images in this pic are from my blog! 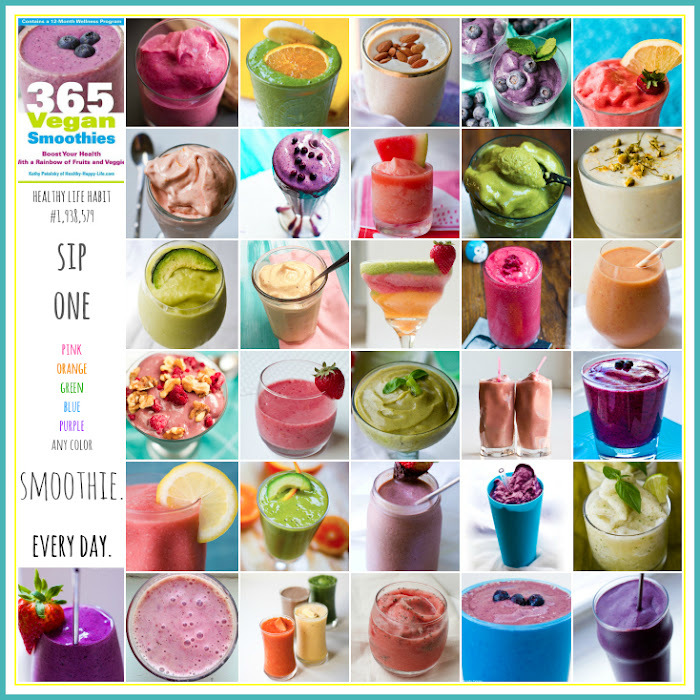 365 Vegan Smoothies contains NEW, never-seen-before recipes and photos! I can't wait to share them with you! 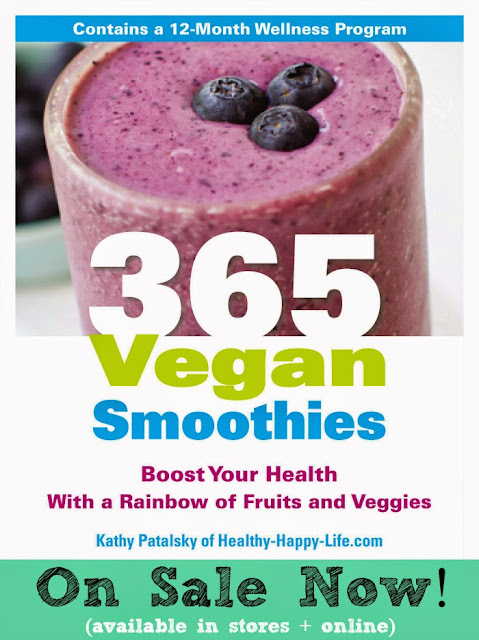 "365 Vegan Smoothies" is published by Penguin Group / Avery. More details from Kathy here.